Japan’s navy raises its profile in the South China Sea, conducts joint patrols with U.S. Warning of the global consequences of China’s “rule bending” in the South China Sea, Japan’s defense minister said Tokyo will increase its joint patrols with the United States. 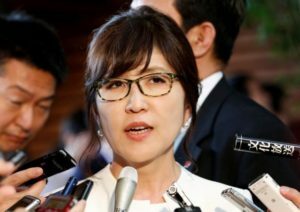 Japan also will increase bilateral and multilateral exercises with regional navies, Defense Minister Tomomi Inada said on Sept. 15 in a speech at the Center for Strategic and International Studies, a Washington think tank. “Japan, for its part, will increase its engagement in the South China Sea through, for example, Maritime Self-Defense Force joint training cruises with the U.S. Navy and bilateral and multilateral exercises with regional navies,” Inada said. “In this context, I strongly support the U.S. Navy’s freedom-of-navigation operations, which go a long way to upholding the rules-based international maritime order,” she said. Japan said earlier this month it was prepared to provide Vietnam with new patrol ships. Tokyo also agreed to provide two large patrol ships and lend up to five used surveillance aircraft to the Philippines, another country at odds with China over sovereignty issues in the South China Sea.